Now that the weather is warmer and evenings lighter, I felt it was time I went for a nice summery fish dish as it's been a while. Pascale's recipe seemed perfect as it combines the fish with chorizo - the top savoury ingredient in my tag cloud (make that the current total plus another one!) So far, I've loved the way she uses so many different flavours in her recipes but they all come together to make a really tasty dish. This recipe wasn't shy in its ingredient list. 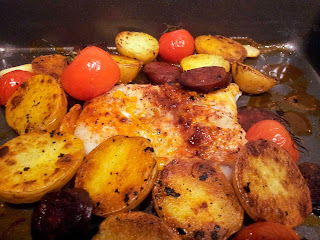 Fish, chorizo, lemon, cherry tomatoes, thyme and paprika all jostled for attention. Sadly, in my case, the fish lost out and was just a random, tasteless piece of protein to bulk out the dish. Maybe it was because I used frozen fish that it was so tasteless and perhaps the luxury of being able to nip to a local fishmongers would significantly improve the fish in the recipe. I had seasoned it to what I thought was within an inch of its life and had been a bit heavy-handed with the paprika. But on eating, there was this tiny layer of tastiness followed by the overwhelming blandness of the fish. And it wasn't even a welcome blandness that some heavily flavoured dishes need as contrast. It was just 'blah'. I made a small addition to the recipe. Pascale suggests serving it with saute potatoes or crunchy chips. Because I am time poor, I cooked my potatoes alongside the dish - halving baby new potatoes, frying them cut side down in the pan with the chorizo and baking them in with the fish to finish off. This worked really well as they picked up some of the flavour from the chorizo when frying. Definitely a good twist to the recipe in my humble opinion. Put a frying pan over a high heat, add the potatoes (with the cut side down), the chorizo and the thyme and cook for five minutes. Put the fish in a roasting tin, season with salt, pepper and paprika and sprinkle over some of the lemon zest. Drizzle over the olive oil and sprinkle the tomatoes and the garlic around. Scatter the chorizo and potatoes around the fish and bake in the oven for 12–15 minutes until the fish is opaque and shiny inside. Serve with a crunchy green salad.